Tap Reminders on the Home screen. 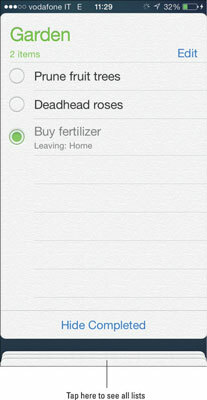 The Reminders screen opens. The first time you open Reminders, you see a blank list. Type the task you want to remember. The task appears in the list with a radio button to the left and an info button to the right. Tap the info button to open the Details screen. Tap each item to specify how you want Reminders to help you remember this task. Remind Me On a Day: Tap On and tap the date to open a rotor that allows you to specify the date and time. You also have the option to Repeat at an interval you select. Remind Me At a Location: Tap On, then tap Location. Tap one of the choices that appear: Current Location or Home, or tap in the Search field to enter a specific street address or the name of a person or business that you have stored in Contacts. Tap the address you want to use and a map showing the address appears in the bottom half of the screen. A pin indicates the address and a circle indicates the geofence, which is the distance from your address at which the Reminder will be activated; drag to increase or decrease the geofence. Tap either When I Leave or When I Arrive to hear an alert when one of these actions occurs. Tap Details in the upper left corner. 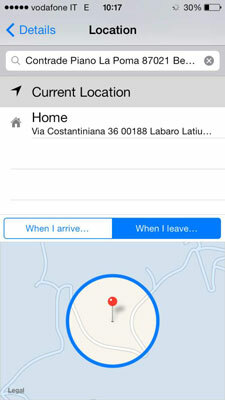 The Location option only works with iPhone 4 or later and doesn’t sync with Outlook or Exchange calendars. It works better if you use a street address, and you do need a GPS connection when you’re at the location for location-based Reminders to work. Go to Settings→ Notifications to choose the alert tone and style you want Reminders to use and while you’re there, choose whether to include Reminders in the Today view of the Notification Center. Priority: Tap the exclamation points to set the task’s level of importance. List: Tap to choose which list you want to keep the reminder. Notes: Tap to type in any additional details about the reminder. Tap Done to return to the list. Go to Settings→Reminders and choose the Default List so when you create new reminders outside of a list, for example in Outlook or another app that syncs to Reminders, they are added to the chosen list. To rearrange the order of items in your list, tap the Edit button in the upper right corner and then tap and drag the list button to the right of each item to move it up or down in the list. Edit a task by tapping the item and then tapping the info button to the right of the task to open the Details screen. Edit the task following the steps you use to create a task. Edit a task by swiping across the task and then tapping the gray More button. Delete an item by swiping across the task and then tapping the red Delete button. Delete an item by tapping Edit and then tapping the red and white minus sign to the left of the item. When you complete a task, tap the circle to the left of the task on the list. You can hide or view completed tasks for a specific list by tapping Edit then Hide Completed or Show Completed at the bottom of the list.